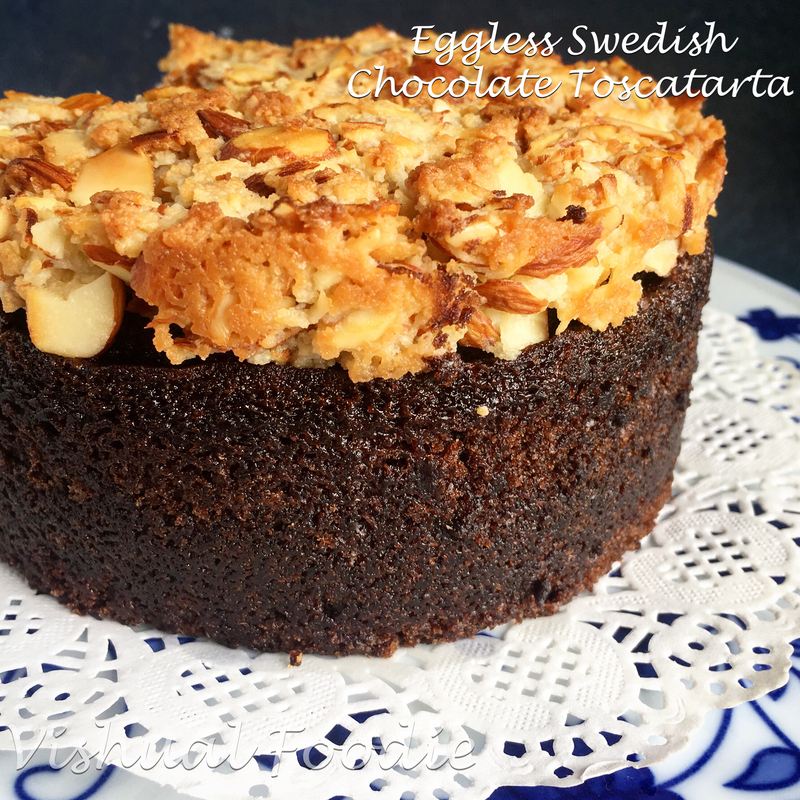 This is a chocolate version of the Swedish Almond Cake or Toscatarta. The butter moist sponge is fudgy and oh so chocolatey while the crisp almond top gives it a beautiful contrast. Good eggless recipes are hard to find. And this ones a keeper. 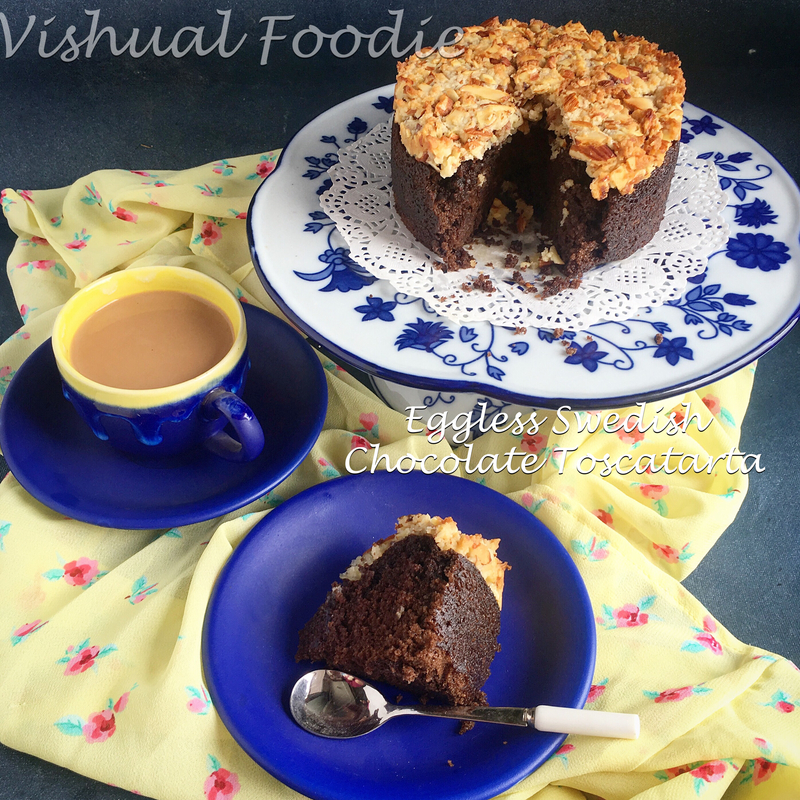 It’s a recipe shared by Anuja Sule from Simple Baking and it’s been on my pending list since ages. Now kicking myself that why didn’t I try it sooner. 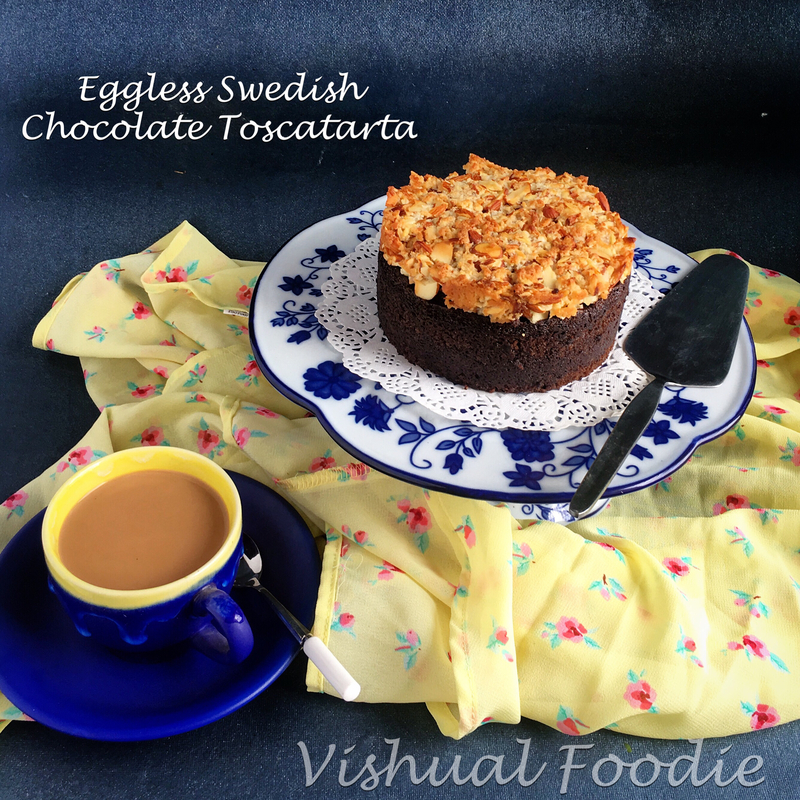 This is the perfect cake to serve at tea time to impress your guest list. Preheat oven to 175 degrees Celsius. Butter and line with parchment paper, an 8 inch round cake tin. In a bowl, stir together the flour, sugar, sifted cocoa powder, baking powder and baking soda. Add the melted butter, water, lemon juice/vinegar, and vanilla extract. With a fork or whisk, mix all the ingredients together until well blended. Spoon the batter into the prepared cake tin and bake for around 20-25 minutes, until a skewer inserted into the centre if the cake comes out MOIST but not totally clean, as the mixture will still need another 10 minutes of cooking. Increase the heat to 200 degree Celsius. Just before the 25 minutes are up, make the topping. Place the butter in a saucepan over medium heat. When it has melted, add the remaining ingredients and bring to the boil, allowing the mixture ti bubble away for 1 minute. 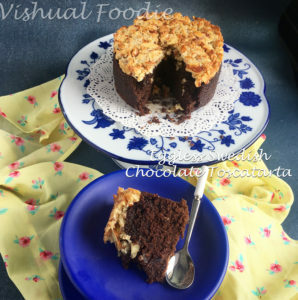 After the cake has been cooking for 25-30 minutes, remove it from the oven, and spoon the almond mixture evenly over the top. Place it back in the oven and bake for about 10-15 minutes or until the topping is golden. Leave to cool in the tin for 10-15 minutes. Carefully unmould from tin and place on a wire rack to cool completely.